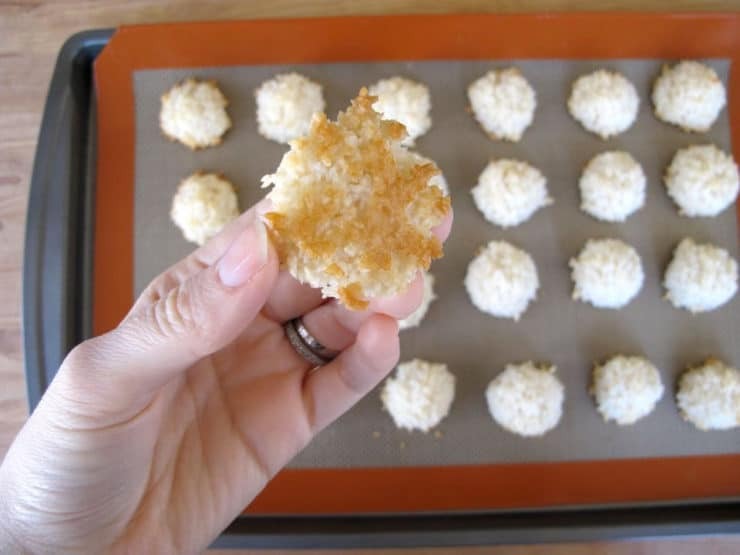 Many of you are familiar with the coconut macaroons available in the Jewish section of the grocery store during Passover. 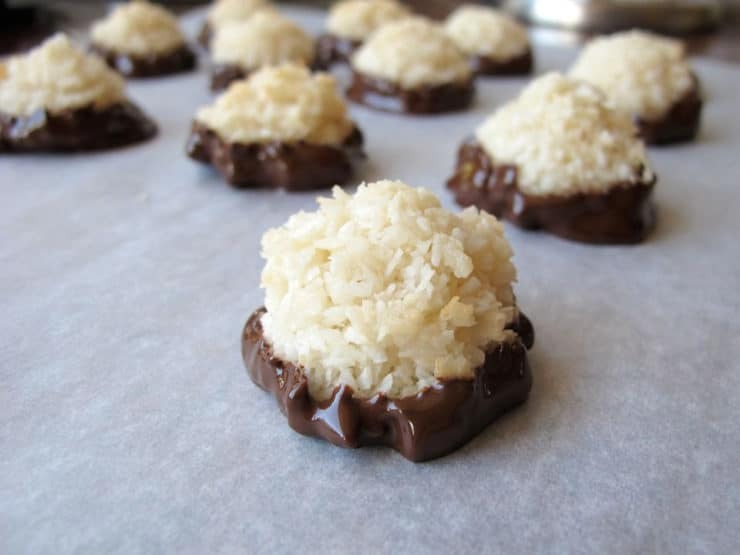 These sweet coconut gobs, housed in a canister and preserved for who knows how long, cannot compare to homemade. A good homemade macaroon is crisp and light on the outside, soft and moist within– a perfect blend of sweet, crunchy, coconutty goodness. Macaroons are actually very easy to make. Once you try them, you’ll never go back to store-bought. Need a good recipe? I’m here to help! Macaroons originated in Italy in the 1700’s, where they were first made with almond paste. The recipe was adopted by Italian Jews, who appreciated that the chewy cookies contained no grains or leavening, and thus could be enjoyed during Passover. In Mediterranean Sephardic Jewish communities, macaroons are usually made with almonds, like they originally were in Italy. American macaroons are more often made with coconut, like the recipe I am sharing with you today. To add a bit of decadence to the standard macaroon, I’ve dipped and drizzled them in dark chocolate. The combination of rich dark chocolate and sweet, chewy macaroon is impossible to resist. To make these macaroons pareve (dairy free), make sure you use a dairy free dark chocolate. There are many kosher varieties. Alprose makes a lovely Passover-approved pareve dark chocolate. Or, if you’re not worried about keeping things kosher, use any chocolate you like. Did I mention they’re gluten free? I promise, once you try these macaroons, you’ll never buy another canister from the market again. Enjoy! 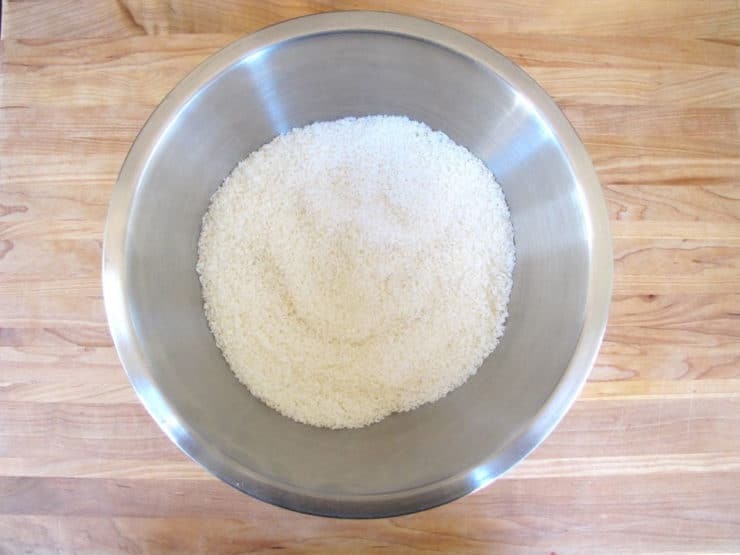 In a large mixing bowl, use a fork to stir together the shredded coconut, potato starch, sugar and salt till well blended. Break up any chunks of potato starch with the fork. 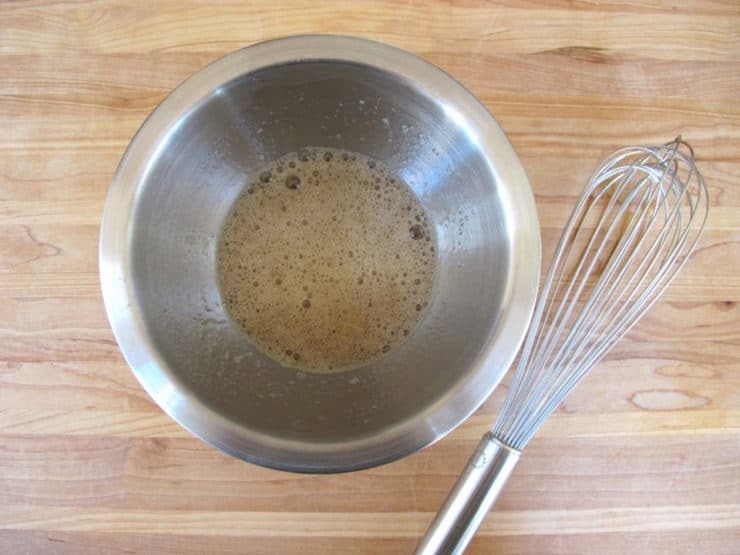 In a smaller bowl, whisk together the egg whites and vanilla till frothy. 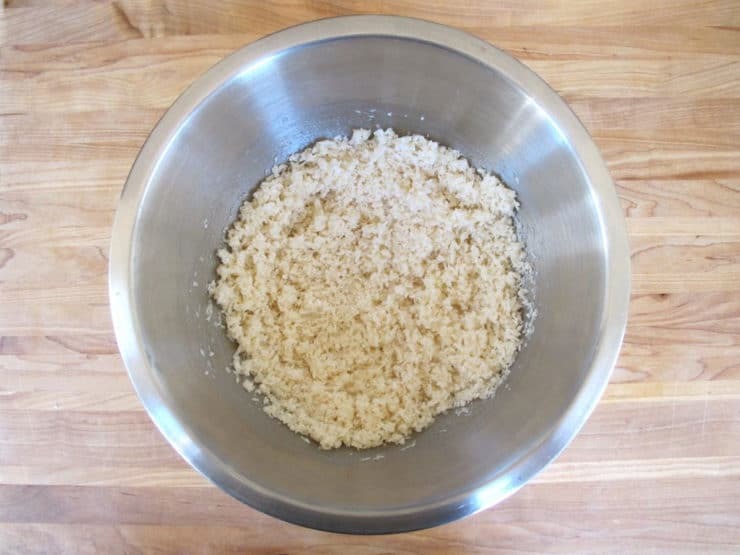 Pour the egg white mixture into the dried coconut mixture. Use the fork to stir the batter together, making sure the coconut is fully and evenly moistened by the egg whites. Let the mixture sit for 20-30 minutes while the coconut rehydrates. Preheat oven to 325 degrees F. Stir the batter again with a fork. Line a baking sheet with parchment or with a Silpat. Scoop up the batter in tablespoonfuls and drop them onto the baking sheet, evenly spaced. They won’t spread, so you can bake them fairly close together. The batter will be delicate… it won’t “hold” together the way a cookie dough does, but as they bake they’ll stick together and solidify. When you’ve dropped all of the batter onto your baking sheets, use wet fingers to gently shape the macaroons into rough domes or haystacks. Don’t worry, they’re not supposed to be perfect. 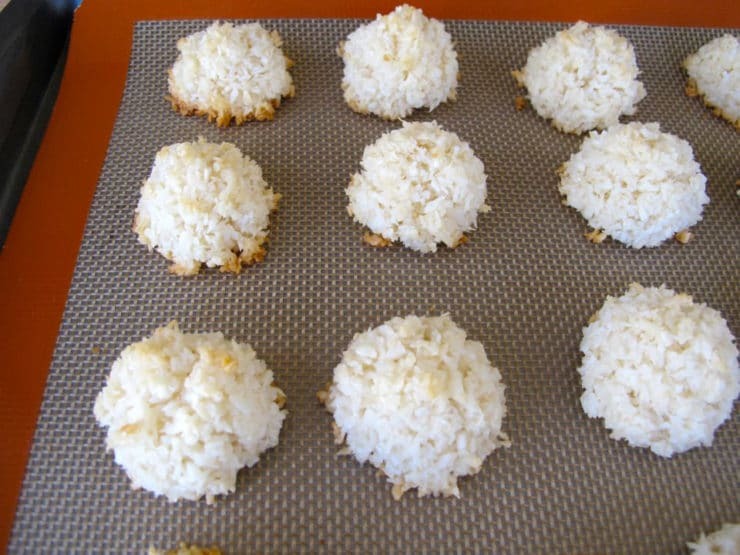 Bake the macaroons for 20-25 minutes till the bottom edges turn golden and the tips of the coconut shreds start to brown. Remove from the oven. Don’t over-bake or they will become dry. Let the macaroons cool directly on the baking sheet before moving them. Trying to move them too soon will cause them to crumble. When the macaroons have cooled completely, you can dip and decorate them. First, place them on a flat surface lined with parchment paper. Melt 9 oz dark chocolate, either in the microwave or in a double boiler. I melt mine in the microwave at 50% power for 1 minute, stir, then continue to melt in 15 second bursts at 50% power till the chocolate becomes smooth. 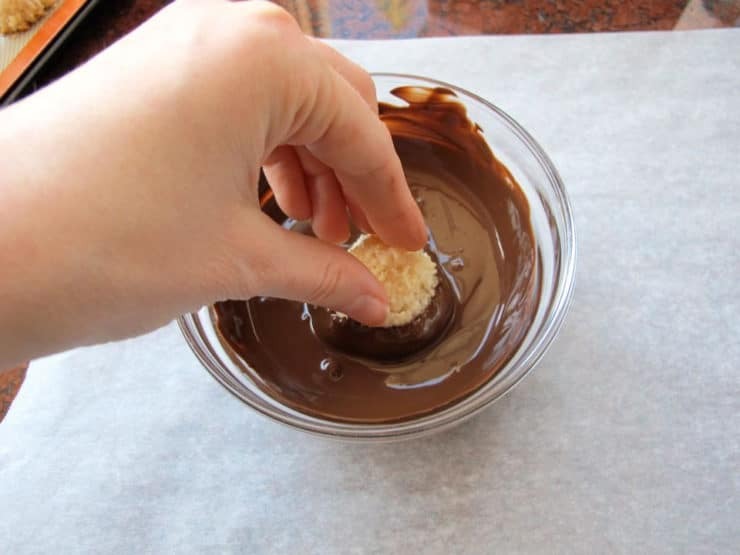 Grasp each macaroon at the top and dip the wider base into the melted chocolate, twisting it into the chocolate and coating it about 1/4 inch up the sides. Pull macaroon up and let excess chocolate drip back into the bowl (you may need to "help" the excess off with your finger), then place the dipped macaroon onto the flat parchment. Repeat for remaining macaroons. When all the macaroons have been dipped, melt the remaining 4 oz dark chocolate and scoop it into a plastic zipper bag (Ziploc). Gently squeeze all of the chocolate to one lower corner of the bag, then close the top of the bag, leaving a small gap so it's not completely sealed shut and air can escape. In the corner where you've pushed the melted chocolate, use scissors to snip a very small corner off of the bag. You'll be able to squeeze a small, thin stream of chocolate through this whole. 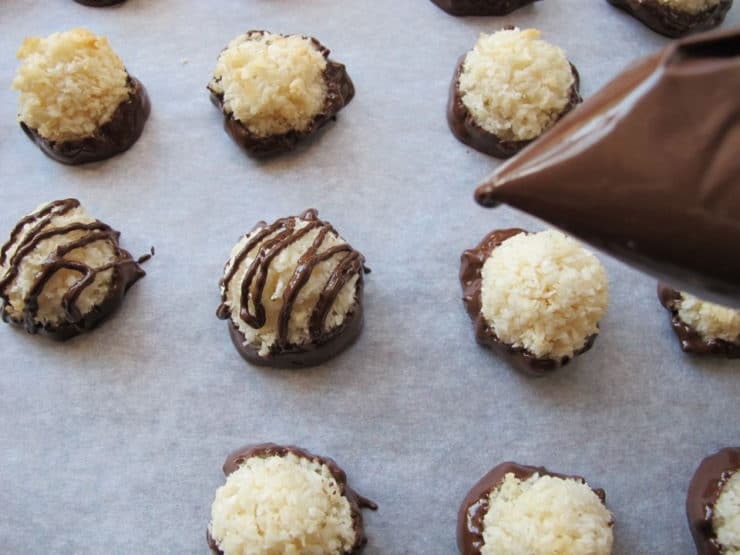 Drizzle the tops of the macaroons with the chocolate, making a zig-zag motion to decorate. Once the macaroons have been decorated, allow them to dry. Depending on the weather or temperature in your home, this can take several hours up to overnight. 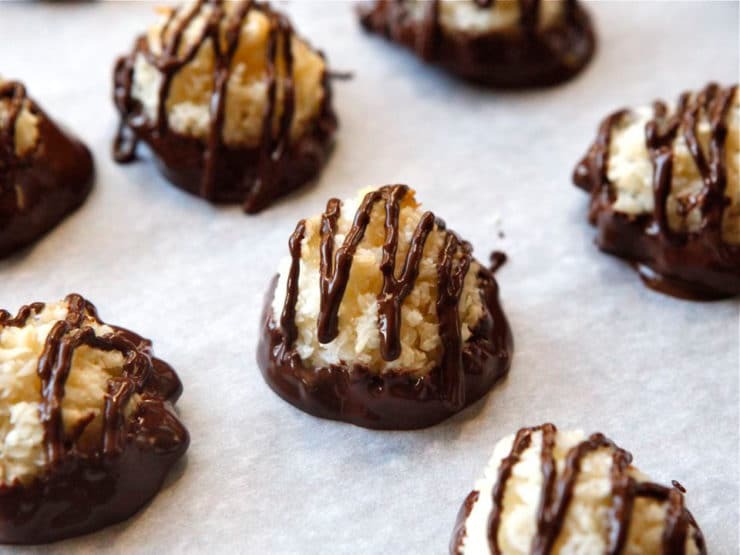 To speed the process, decorate macaroons on a parchment-lined tray and place them in the refrigerator; the chocolate will firm up faster that way. Once the macaroons are completely dry, store them in a sealed Tupperware container in single layers divided by parchment or wax paper. A sealed container is very important, it will keep the macaroons moist and stop them from drying out. Store at room temperature for up to 4 days, or in the refrigerator for 7 days or longer. I’ve made these several times now and they’re a hit every time! They’re delicious and for those of us who are gluten free they’re a perfect treat. I could find only sweetened coconut. How can I use it with this recipe? The measurements of liquid would need to be adjusted, and sugar omitted since sweetened coconut is quite sweet. Unfortunately without testing it I cannot advise on exact amounts. These were a huge hit at our seder last night! I’ll be adding them to my must make next year too. I’ve made these several times-they’re great. But I’ve never really had luck with the chocolate drizzle. It always globs up,or crystallizes In the tip. I’ve been using Trader Joe’s dark chocolate blocks. Can you recommend something that works better or suggest an refinement of technique? Hi Parker! I’m not sure. It could be the type of chocolate you are using. Also if there are any drops of water present in the bowl or double boiler that you’re using to melt the chocolate, it can seize and create issues. Hi Lisa, I use large egg whites when making this. Are you sure you’re using shredded unsweetened coconut? Nobody has ever remarked on this issue before so I’m curious what is going wrong for you. Well, I used coconut sugar, ’cause I didn’t have white sugar. These little gems were not beautifully white like those in the picture, but they are sure tasty. I don’t think I have ever had a fresh-baked macaroon, and I certainly have never made them before. Start to finish took some time, but they aren’t difficult to make. I’m grateful someone in the comments suggested using a melon- baller to scoop the cookies. That worked great. Such a treat. Thanks for posting this recipe! So happy you liked it Kelly! What can I use in place of potato starch?. Hi there, this recipe looks great. My husband wants chocolate macaroons, any suggestions on how much and what kind of chocolate to add to these to make them all chocolate? Hi Rhianne! I don’t have an exact amount without testing it, but you could try adding a tablespoon of cocoa powder to the coconut batter. That should give it a nice, chocolatey flavor. You might need a bit more or less, I can’t say for certain without testing it. Good luck! Loved this recipe! I tweeted it a bit to do something different, but the recipe worked great. I added about 2 Tbsp of almond paste when I wet the coconut mixture. I really worked it well in to the mix, and increased the coconut by about 1/2C. Instead of chocolate, I made a lemon zest icing with lemon zest , lemon juice and confectioners sugar. And, I’m serving with fresh strawberries. The macaroons came out delish! These look amazing! Can I use corn startch instead of potato startch? Thanks! Hi Julie– yes absolutely. Some Jews avoid corn during Passover because it falls into a class of foods known as kitniyot. However if this is not your tradition, by all means go for it! Absolutely delicious! The best Passover dessert ever! Hi Lorraine– that is a very long time to keep them in the refrigerator. If it were me, I wouldn’t refrigerate them longer than a week or so. I would probably freeze them instead to ensure freshness and food safety. I made these last night for a Seder tomorrow. I haven’t dipped them in the chocolate yet, but they are perfect – just chewy enough, just sweet enough. I used my small cookie scoop and got 21 macaroons, so I’m making a second batch, and I think I’m adding orange zest to that batch (we have a tree in the backyard). There is always potato starch in this house – my family are Swedish, and it’s common pantry staple there. Thank you, Tori, for a recipe that uses unsweetened coconut. It’s worth seeking out, as the shreds are finer, which makes the macaroons more tender and chewy than using the larger sweetened shreds. Hi Tori,all I can say is YUM,Easy and Happy Passover! These are soooo good,the ones in the can cannot hold a candle to these.I followed the recipe exactly,except I used half sweetened and half unsweetened coconut,also cut the sugar to 1/4 cup.Great recipe,it’s a keeper! Thanks! Made these for my sons school seder tomorrow…. hope they like them! Hi Lama, good question. Honestly I’m not sure, I don’t have any experience cooking with coconut flour and almond flour is not very absorbent… the point of the starch is to absorb excess liquid and create a sticky binding agent. They might work but I can’t promise anything because I haven’t experimented with it myself. Yeah, ive made them 4 times, but each time with sweetened coconut and about 1/8th c of sugar. (Kids and an office party) I didnt let the mixture sit for as long as directed. Once also with a home made almond butter… a very nice twist. Just 1/2 cup almond slivers in the magic bullet till pastey. Made these twice this passover. First time I couldn’t find the unsweetened coconut flakes, so I used the sweetened with 1/4 cup sauger just like suggested in one of the comments. They came out DELICIOUS! Second time, I was able to find the kosher for passover unsweetened coconut flakes and followed directions to a T.
I had a hard time getting them to stick together. Once baked, they were extremely dry. Next year I’ll be making them with the sweetened coconut flakes! I’ve been making these since last year. They are super easy and delicious. I wonder if tapioca starch would work in this recipe? Good question Irene… it might! I have never tried it. Had a little problem getting them to bind together when using a cookie scoop, so ended up making them by hand (gloves, and pressing them together). That worked. However, I didn’t get them as small as I would have, by using a cookie scoop (as if anyone will complain at having a larger cookie). Wonder if an additional egg white would help. Trying to evaluate what could have been the problem – age of coconut, perhaps? You wouldn’t think it would be on the shelf long, but who knows? I let them sit to absorb for more than half an hour – would that make more of a difference? Hi C.M.– it’s possible that they sat a bit too long and dried out a little. The egg is the binder here, so if the mixture dried out at all it might have become more crumbly. You can always remedy this problem by adding a bit more egg white. Just made these and they are delicious!!! First time macaroon maker! I couldn’t find any locally this year for some reason. My kids would not have been happy if there were no macaroons. Very easy recipe, and I won’t ever have to buy them again. Thanks! So happy to hear that Anuleif! Yes I made it just as it was written and still it didn’t work at all. They stuck terribly and it made a big mess. I’m very sorry to hear that. I’ve only heard of this happening when people omit the potato starch. Not sure what went wrong for you, as this recipe has worked for so many other readers. Sorry you didn’t have a better experience! I made these today and they won’t come off the paper at all the edges spread way out and I had to cut off all the edges and just use the middle section which tasted fine but what a mess. Plus I lost half the size of the cookie. Did you make the recipe as written Soccer Mom? I’ve only heard of this happening when people have substituted or omitted an ingredient. I dipped them in orange dark chocolate. You have got to try it. 🙂 Thank you for the fantastic recipe! I can’t wait to share these with family and friends! These look fantastic, but my daughter is allergic to potatoes, and I don’t think corn starch is kosher for passover. Could I substitute arrowroot for the potato starch? I don’t know if it will have the same effect of binding together the coconut. Hi Sara, unfortunately I haven’t tested any subs other than corn starch. Wish I could help! I am wondering if it is possible to substitute the potato starch for coconut (or another gluten-free) flour. Would it have the same binding effect, or is the potato starch necessary? Hi Melissa, corn starch is the only gluten-free sub I have tested (it worked great). The starch is necessary to help bind the macaroons and make sure they bake up correctly. I have this recipe on file for my daughter who is gluten intolerant. The only caution I would make is: Do not substitute flour as is mentioned if these are to be totally gluten free. Not everyone would recognize the damage to the digestive system if a specific type isn’t noted in the recipe. As is written with the potato starch, these are fabulous. Excellent point Sally. Glad your daughter is enjoying these! Making these now.. Can’t wait to try them… Love macaroons but never had them this fresh.. My girls are super excited to try them. I didn’t use potato starch, quadrupled the recipe and the cookies had a base sort of like a cookie spreading out! What did I do wrong??? I am guessing it was the sugar and egg whites? I followed the recipe to the T. Would the potato starch help with those ingredients being more mixed?? Hi Terri, unfortunately you didn’t follow the recipe to a T– you omitted the potato starch and you quadrupled the recipe. The potato starch is an essential ingredient in this recipe. It helps to bind all of the ingredients together, particularly the coconut shreds, and stops them from spreading out while baking. If you’d like, you can sub 1/4 cup of flour for the potato starch (per batch). Also, I would be careful with quadrupling baked recipes, you can end up with very mixed results depending on the recipe. Hope that helps! Thank you. I’ll try the flour next time. Good luck Terri, let me know how it works for you! I made these for Passover this year and used chocolate chips in the batter instead of glazing them. They were easy and delicious! Would make again! Have you ever heard of anyone making them with fresh coconut? I dislike all the additional preservatives in the can coconut. I love homemade maccroons and love how beautiful yours are. Thank you so much for the recipe!!!! Hi Carol, I don’t use canned coconut for these, I use dried grated coconut which has no preservatives– it’s simply dried coconut shreds. I rehydrate the shreds with water. You could also make them with fresh shreds if you prefer, the process is the same. Everyone who adores me for my baking loves me so much more now. I dislike coconut, yet I actually eat these. We don’t keep Kosher for Passover so I added 1/4 C. flour, and since I could only find sweetened coconut I used 1/4 C. sugar as per another poster’s recommendation. Baked for 22 minutes. PERFECTION. Everyone swears they are the BEST macaroons they’ve ever tasted. No doubt! And the extra drippings of dark chocolate that I accidentally spilled were an added bonus. you mentioned making these with ‘almond paste”? 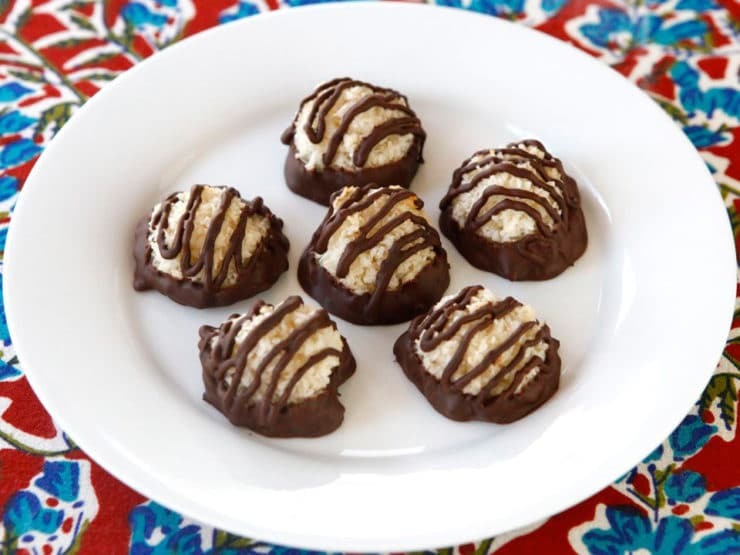 My son is allergic to coconut, so would LOVe to make these with almond paste if possible. Also, no kosher section in stores here in Costa Rica so will have to figure out something!!!! Hi Anna– I was speaking of the history of macaroons, and that they were originally made with almond paste, however I don’t have an almond modification for this particular recipe. I will try to post an almond-based macaroon recipe soon. So cool that you live in Costa Rica! I made these yesterday, and they’re delicious! I could only find sweetened coconut flakes in my supermarket, so I just added significantly less sugar (probably less than 1/8 of a cup). They dried quickly, too, after I dipped them in the chocolate. Thanks for sharing the recipe! I know what I’m making tomorrow! Thank you so much for the recipe…. Chag Sameach! Looks awesome! I would so love to try some. I am sure they taste amazing. Hi Tori, I made the chocolate dipped macaroons. They were actually not that hard to make. They were delicious! Thanks for sharing! Hi Tori! These taste so delicious! I will never buy the canned cookies again! Even my kids who don’t like coconut loved them! I gave some of these to my parents today. My mom put some out in front of my dad with a cup of coffee he thought they were store bought fancy macaroons! I love them! The best part is they are super duper easy and not super sweet. Thank you for sharing your recipe! Hi Tori! Just made these tonight and could only find sweetened coconut. Just now saw your modification above, but I cut the sugar to 1/4 cup and used 4 egg whites. I scooped them out with a melon baller and cooked for the entire 30 minutes and they came out PERFECTLY. Dipping tomorrow with when I dip the strawberries. Thanks for the fantastic recipe! Just made these for Passover and tested one and it was SO GOOD. All the other recipes I have tried have been with sweetened condensed milk. These were nice and homogenous throughout, instead of coconut on top of a caramelized pool of condensed milk. I added 1/2 a cup of sliced almonds into the batter as well. This is my new go-to macaroon recipe! Awesome Mike! So happy to hear that. I experimented quite a bit to come up with this combination, it was definitely worth the extra effort. OMG these are amazing. I didn’t think I was a fan of coconut, but I could eat a dozen of these. My entire family loved them and they were soooo easy to make. All I can say is WOW. I agree with Denise I couldn’t find unsweetened for some reason but into have sweeten coconut.. If I left out the sugar think that would work? Hi Sharon, I’m not sure if sweetened will work the same way, because it is a lot moister than the unsweetened shreds. If you try it, cut the sugar to 2 tbsp and maybe start with 3 egg whites, then add a fourth if you need it. FYI, unsweetened coconut can be found at most kosher markets, kosher grocery stores, and health food markets (like Whole Foods). Bob’s Red Mill makes a great one. Is there any way this recipe could be adjusted for sweetened coconut? I bought it and can not return it. I have never been a macaroon person, since I really don’t like coconut. Do you have a Passover recipe with almond paste instead? Thanks! Not on the site yet, but I’ll keep it in mind for a future post! Sounds delicious, but how can this be considered vegan when the recipe calls for egg whites?? Perhaps I’m missing something? You are right, it was inadvertently added to the vegan category. I corrected the post. Thanks for the heads up! Why potato starch? I have never seen that in a macaroon recipe. That’s why my recipe is special Kim! 😉 I’ve never seen one with potato starch either, but as I tested multiple macaroons variations I thought I’d try it out. The addition of the starch made a world of difference to the final macaroon. 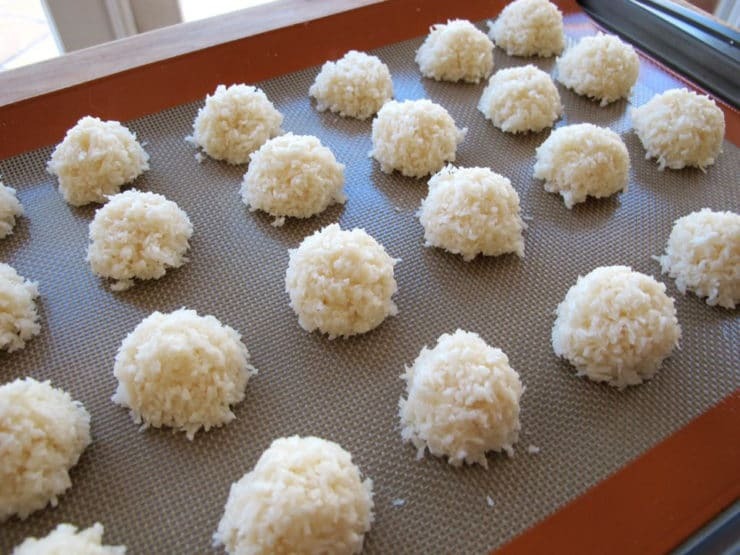 The potato starch helps to bind the coconut mixture (the “batter”), and helps to soften the texture inside the macaroon after it is baked. Try it! Tori, any alternatives to Potato starch? corn starch, maybe? These look good…I just may go buy some potato starch!! !